Many years ago, I was enraptured by the Royal Shakespeare Company’s production of The Life and Adventures of Nicholas Nickleby on its second visit to Broadway — while I did not see the late great Roger Rees in the title role, it was a splendid, surprising, and enthralling production. I later saw the RSC’s imaginative production of Les Liaisons Dangereuses with a fabulous script by Christopher Hampton and a gorgeous death scene by Alan Rickman. You might understand, then, why my complete faith in the RSC led me to purchase two tickets, a matinee and an evening performance, to see the dramatization of newer books I’d read. My faith was not misplaced. Mike Poulton’s adaptation of Hilary Mantel’s novels is sterling, as is the RSC’s production. 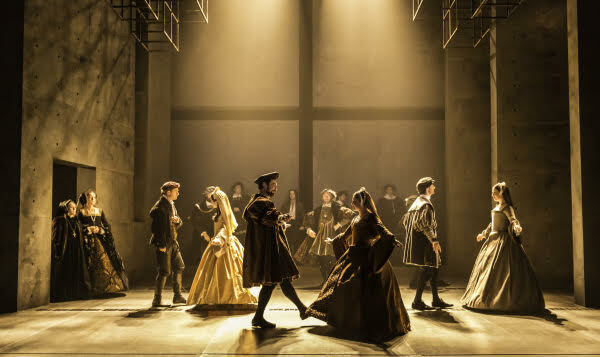 Wolf Hall (the Play’s Part I is based on Hilary Mantel’s novel of the same name, Part 2 on the second novel of the series, Bring Up the Bodies) is enormous, crowded with characters and history, politics, religion, and emotions. Poulton weeded carefully without sacrificing vital story lines that drive the action. Plaudits to him and to director Jeremy Herrin who made around six hours of theatre riveting and coherent. The RSC & Mr. Poulton took a dense book with many characters, family trees, decades, and told its story with empathy and grace. This is history with action, passion, fury, fear, and courage. For the theatregoer, this is immersion theatre that doesn’t ask you to walk up and down the stairs and take part in the scenes. The audience in both the matinee and evening performances I saw were attentive and punctual, laughing or gasping in response — a fine double-helping of theatre. The production design by Christopher Oram is all encompassing, realistic to the period and yet theatrically viable. Fires spring up from grates in various parts of the stage to serve as natural lighting in the design by Paule Constable (Part 1) and David Platers (Part 2). The lighting is intimately soft in the smaller scenes, while the court scenes seem to glow naturally. Many scenes remain artistically dim, a heightened reality of the 16th century darkness allowing the audience to settle in to the past. This story is peopled by many familiar names and as many unfamiliar ones. Those who know their Shakespeare will recognize more characters, although the take on the same historical characters will vary all the way to oppositeness in different plays with different points of view. Suffice to say, the “noble” families of England were as powerful as American mob bosses in the 20th Century and frequently with morals as lax. The nobility of England, however, all too often had what law there was on their side. What no mob boss or “noble” will accept is a challenge to its power base. Thomas Cromwell was a challenge to the old guard’s power base, because he was trying to set the government on a path of sanity and logic. These things are always threats. And then, of course, there were the religious battles of the break from the Church of Rome. Thomas Cromwell was in the midst of upheaval on all fronts. Some considered him the cause. The red-clad Cardinal Wolsey walks in and out in life and death, the past ever present. Peter Eyre’s Cardinal is witty, urbane, vain and tall. Mr. Eyre then played Wolsey’s successor Archbishop Warham as a small old man, dim and muddled. The splendor of Roman Catholic Church garb of Mr. Eyre’s first role contrasted with the drab habiliments of his Warham and his final character, Keeper of the Tower. Mr. Eyre’s three totally different characters, clearly delineated, each deeply grounded in a whole person, were indicative of the doubling and trebling of characters played by this wonderful company. Ben Miles is superb as Thomas Cromwell. 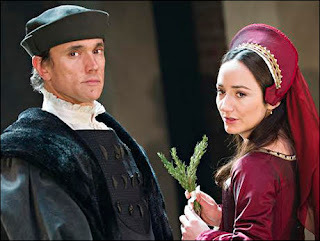 I am a huge fan of Mark Rylance, whose small screen performance — in the PBS miniseries based on the same books — as Thomas Cromwell was inward. Ben Miles gave us the Thomas Cromwell of the novels. Not merely a dour-faced man, a man who knew when to be subservient and when to be a thug, but a man of intellect, wit, and humor. There’s no denying Thomas Cromwell was a thug. Mind you, his bad acts were committed for king and country. Interestingly, he’s more respectful to and considerate of women than any other character in the story. In the books this is clear and that contributes to our affection for him. Hilary Mantel’s books tell the story of England’s break from the church of Rome from very personal points of view: Henry VIII, who wanted a son and heir for his kingdom as well as younger women; Anne Boleyn, daughter of a minor nobleman who rose to marquess thence to queen. Henry’s first wife, the devout Catholic, Queen Catherine (fine work by Lucy Briers) and her daughter Mary (who would grow up to be Bloody Mary); the “nobles” who resented Cromwell’s rise as they had resented the rise of his mentor, Cardinal Wolsey. This story has many characters and as many hopes, dreams, goals, and jealousies. At the center of it all was Thomas Cromwell given thrilling life by Ben Miles. This story of Thomas Cromwell in the reign of Henry VIII is fictionalized for ease of digestion, telling us much more about the man than historians know. Despite his “low” beginnings — the son of a blacksmith from Putney — Cromwell took on the burdens of a feudal lord, grew an enormous household and looked after everyone, making a lot of enemies and money doing it. He refers to himself as a lawyer or a banker, perhaps an accidental statesman. Miles draws the audience into Cromwell’s world, his plans, his feelings, his intentions. We are complicit. Nathaniel Parker is a genial, hearty, gruff and sane Henry VIII, unlike Damien Lewis’ more manic portrayal of the monarch on the PBS miniseries. Parker’s Henry was a moon-faced pup who never grew up, whose mood swings were those of a spoilt child — except that the downside led to executions. Sweet and kind turned to a ravening dog on a dime. Anne was a manipulative scold, greedy for the power that could protect her from the caustic court. Lydia Leonard’s final scenes were run through with fear and made Anne suddenly pitiable. Most of the women portrayed onstage were unpleasant creatures, until we remember what a horrid life of minimal choices they led. Any port in a storm. The production’s doubling is skillful and clever – Chapuys and Stephen Gardiner are both played by Matthew Pidgeon, the former emotional and wild, the latter distant and repressed, utterly different ways to play anger. Terrific doubling, nay, tripling by Leah Brotherhead as Princess Mary, Jane Seymour, and Lady Worcester. One might have thought that it was three actors except that no one else on the stage was as petite as she. John Ramm was unrecognizable in each of his three roles — Thomas More, Henry Norris, and Sir John Seymour. Pierro Niel-Mee personified the ruffian (as Cromwell was himself in his youth) Christoph, Cromwell’s loyal French servant, then changed course and also played the insensitive courtier Weston. Olivia Darnley was delightful and earthy in her short lifespan as Thomas Cromwell’s wife Lizzie, then reappeared as Mary Boleyn with the same lust for life, as well as portraying a third lady. I could name the whole cast, so pleased was I with each and every one, but then I expect that of the Royal Shakespeare Company. 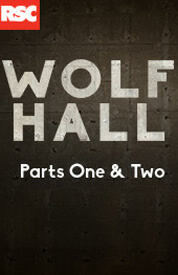 The RSC’s Wolf Hall, Parts 1 and 2, exemplified the joys of theatre — which should not be mistaken for history. ~ Molly Matera, signing off to go back to the books….